This simple clear bag displays your candy beautifully. The 3x5" bag is sealed air tight and holds approx. 65g or about 16 pieces. Click here to go back to all packaging options. There is a minimum order due to the nature of making the personalized candy, and is equal to about 22 lbs. of candy. 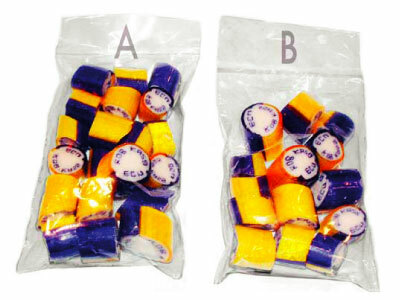 For a slightly larger amount in each bag, check out Standard Bag A (78g) Packaging. Pick the colors for the outside of the lolly and the text from the options below. Although not necessary, it may be helpful to you download an order form to specify all of the design-related info, that you later can FAX to us at 877-249-6419.